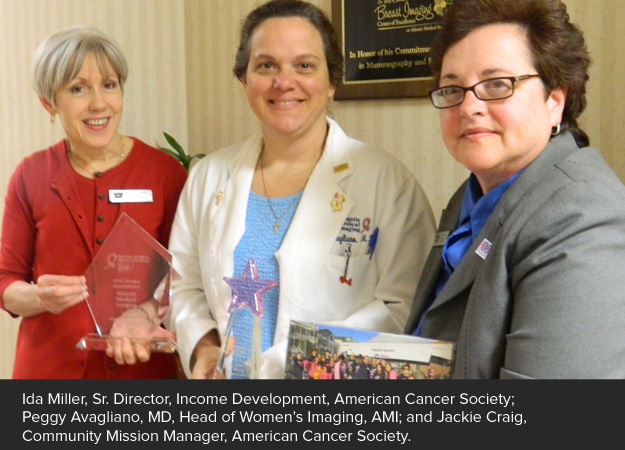 The American Cancer Society recently presented Atlantic Medical Imaging (AMI) with a plaque in recognition of AMI’s support of the Making Strides Against Breast Cancer Walk in Ocean City, NJ. AMI has been involved with the American Cancer Society event since its inception and has been a Flagship sponsor for the past two years. This year’s Walk will be held on October 20, 2013, on the Ocean City boardwalk. Flagship sponsors are those organizations that are active community leaders in the fight against breast cancer. Atlantic Medical Imaging (AMI) is a quality-driven medical imaging practice committed to clinical excellence by providing innovative service and compassionate care. With 39 board certified radiologists, 450 staff members and eight office locations in Atlantic, Cape May, Ocean and Monmouth Counties, AMI is the largest and most comprehensive provider of imaging services in southeastern New Jersey.